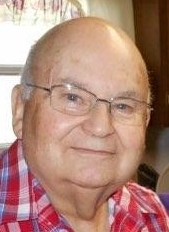 CONTINENTAL - Keith M. Troyer, 85, of Continental died on Wednesday, August 29, 2018 at Mercy Health St. Rita's Medical Center, Lima. He was born April 24, 1933 in Continental to the late Jay and Esther (Kirkendall) Troyer. On July 17, 1954 he married Luella C. Winover and she survives in Continental. Also surviving are five children: James Troyer of Columbus Grove, Gerry (Debra) Troyer of Cygnet, Ronald Troyer of Continental, Cheryl (Jim) Mansfield of Ottawa, and Steven (Stephanie) Troyer of Continental; 17 grandchildren; 22 great-grandchildren; and a sister, Eleanor Carder of Continental. He was also preceded in death by a granddaughter, Shaina Mansfield; twin great-granddaughters: Brilee and Bexlee Troyer; a brother, William Troyer; and his half-brother, Virgil Kirkendall. Keith retired from Philips Electronics, formerly of Ottawa. He enjoyed hunting, especially in Wyoming and a longtime member of the National Rifle Association. Keith loved being with his grandchildren, gardening, and bluegrass music. He was an avid Cincinnati Reds fan and enjoyed woodworking. The funeral service will be 11:00 a.m. Saturday, September 1, 2018 at HEITMEYER FUNERAL HOME, Continental with Rev. James Fry officiating. Burial will follow in Monroe Cemetery, Continental. Visitation will be Friday from 2 to 4 and 6 to 8 p.m. and again Saturday from 10 a.m. until the time of service at the funeral home. Memorial donations may be given to the Continental Library or charity of the donor's choice.